Have you ever found yourself working with a spreadsheet full of data and wishing you could make more sense of the numbers. Have you reviewed sales or operations reports, wondering if there's a better way to anticipate your customers' needs. Perhaps you've even thought to yourself: There's got to be more to these figures than what I'm seeing! Data Mining can help, and you don't need a Ph.D. in Computer Science to do it. You can forecast staffing levels, predict demand for inventory, even sift through millions of lines of customer emails looking for common themes - all using data mining. It's easier than you might think. 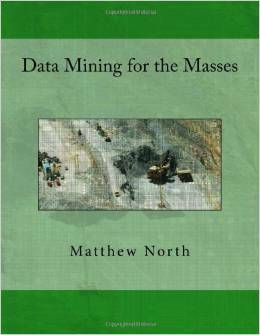 In Data Mining for the Masses, professor Matt North - a former risk analyst and database developer for eBay.com - uses simple examples, clear explanations and free, powerful, easy-to-use software to teach you the basics of data mining; techniques that can help you answer some of your toughest business questions. You've got data and you know it's got value, if only you can figure out how to unlock it. This book can show you how. Let's start digging! Through an agreement with the Global Text Project, an electronic version of this text is available online at (http://globaltext.terry.uga.edu/books). Proceeds from the sales of printed copies through Amazon enable the author to support the Global Text Project's goal of making electronic texts available to students in developing economies.